Alcohol. It's a closely guarded secret that a Laser Masters Worlds is not about sailing; it's really about the parties. The organizers will have a party for the opening ceremony. They will have another party for the prize-giving and closing ceremony. There will be at least one other official party during the week. Each major nation and continent will organize a party for its sailors; there's bound to be a North American Laser Class party. Some of our fellow sailors will organize parties too. At all of these parties huge quantities of alcohol will be consumed. None of us wants to be a party pooper. Now is the time to increase our daily alcohol consumption in order to raise our alcohol tolerance to the level we will need to face the challenges of Masters Worlds parties. Fat. We are going to need to raise our calorie intake too in order to meet the physical challenges of racing in those 30 knot winds and 12 foot waves off Hayling Island. Have you ever studied the calorific contents of various nutrients? Carbohydrates and protein only have about 4 kcal/gram. Fat has over 9 kcal/gram. Fat is the way to go, obviously. Eat more fat. Sugar. During digestion, sugars are rapidly broken down into glucose by digestive enzymes in the stomach and intestine, and then absorbed into the blood stream and dispersed around the body as energy for muscles and cells. Sugars provide the best way of raising our energy levels quickly. Sugar is the way to go. Eat more sugar. Caffeine. The 2010 Laser Masters Worlds is being held 5 time zones east of where I live and 8 time zones east of California. That means that we US sailors are going to be getting up to start preparing to sail each day at a time that our body clocks think of as the middle of the night. We will need vast quantities of caffeine each morning in order to function effectively in this disorienting situation. We need to start acclimating our bodies to that now. So what food contains all four essential food groups... alcohol, sugar, fat and caffeine? Irish Coffee is the answer. I recommend one large Irish Coffee for breakfast and one for lunch each day, one immediately before sailing, one immediately after sailing, one after dinner each evening, and one before going to bed each night. You will be amazed at the effects on your metabolism, general health and energy levels. By the way, contrary to what you may have read on a certain blog today, Irish Coffee was not invented in San Francisco. 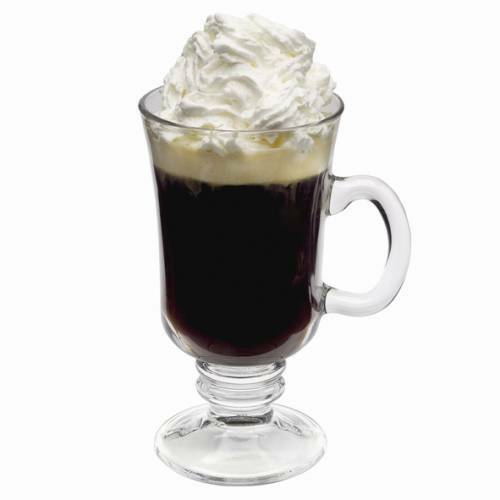 The original Irish coffee was invented by Joseph Sheridan, a head chef at Foynes, County Limerick in Ireland. Foynes' port was the precursor to Shannon International Airport in the west of Ireland. The coffee was conceived after a group of American passengers disembarked from a Pan Am flying boat on a miserable winter evening in the 1940s. Sheridan added whiskey to the coffee to warm the passengers. After the passengers asked if they were being served Brazilian coffee, Sheridan told them it was Irish coffee. Years later in 1952, Stanton Delaplane, a travel writer for the San Francisco Chronicle, discovered Irish coffee at Shannon Airport and decided to bring it from one cold, rainy, drizzly, foggy place to another cold, rainy drizzly foggy place... San Francisco. The good news is that the Laser Masters Worlds in 2011 will be in San Francisco and they already know how to make Irish Coffee for us there. and thoroughly captivating post in just a couple of short hours. And since I will in all likelihood never retire, I'll give up trying now. Thanks for the kind words (assuming you are talking about this blog.) It does get a little easier after the first 1500 posts. The Buena Vista has claimed for years to be where Irish Coffee 'originated', although it always seemed unlikely that no one had thought to put whiskey in coffee before they did. I suspect Chef Sheridan wasn't the first, either. Still, Irish Coffee languished in relative obscurity for years and would probably remain there today had it not been perfected by an enterprising and dedicated San Francisco restaurateur and then brought to the world's attention by a passionate San Francisco writer. Our favorite coffee 'sweetener', upon first arriving aboard of a chilly evening, is Kahlua. I'm thinking of naming that 'O Dock Coffee'. Where have I heard that combination before? In Italy, my wife's relatives served espresso with grappa. Delicious, but if that isn't a contradiction! I think you should open a practice, Dr Tillerman. Brilliant! Coffee with Kahlua is Mexican Coffee, a beverage that I am thoroughly acquainted with. Pour coffee, tequila and kahlua into an glass coffee mug, and Stir gently. Garnish with whipped cream and sprinkle a little nutmeg on top. Hola...my first Irish Coffee was drank in San Francisco. I was there for computer training in San Jose, went to San Francisco to meet some friends and by night fall I had to see the sunset on the shore....sure enough, the sailing Puerto Rican had to dip his feet in the water (very cold water)...after that freezing episode, we rushed to a bar atop a hill in a lovely restaurant and I had my first Irish Coffee!! Who cares where and when it was first invented. My first Irish coffee was in Brisbane, Australia, in the 1960's. There's some future for it still on the EU continent. It hasn't made a breakthrough in my part of the world yet! No, wait. That was another case. Antolin, you were lucky you didn't get frostbite. Antolin, there's no such thing as bad weather, just bad Irish Coffee. Perhaps this group is knowledgable enough for me to ask what you call hot chocolate with Baileys? Antolin's recollection of his baptismal Irish coffee is accurate except for one small mistake. The Buena Vista Café is not atop a hill, but rather lies at the base of Hyde Street next to the cable car turnaround near Fisherman's Wharf. I know, picky-picky, but Nob Hill is an unforgettably long, steep climb. i hope that all readerrs know that genuine Irish Coffee is made with genuine Irish Whiskey. My favouriote is Black Bushmills but Jameson or Tullamore Dew are good also. While peaty scotch whisky or american rye have their supporters Irish must be Irish. My crew are already looking forward to their new diet regime in anticipation of next seasons permormance. I just hope that that they dont mix up their goals! !